Here is another brand new cheat but this time around, it's not the usual free browsing cheat that powers all apps and web browsers on your phone but it's a Telegram cheat that allows 9Mobile (Etisalat NG) users enjoy unlimited access on Telegram for free without data or Airtime on your SIM. Telegram has proven to be the real alternative to WhatsApp and it's popularity is waxing stronger by the day as many people are now using it. It's a free chatting app with many features including creating of channels, groups with capacity of up to 50,000 members, upload and sharing of photos, videos, apps, docs etc. Some users complain of the high data consumption of Telegram maybe because they haven't tweaked the app to use less data just as I did mine. You need to disable auto playing of videos and auto download of image files including Gifs to minimize data usage but with this new Telegram Cheat, you don't need to setup all that because you will be enjoying the platform for free as if you are using freebasic. All you need to enjoy free telegram cheat is to change your 9Mobile APN settings to mobilinkworld.com, proxy to 127.0. 0.1 and port to 8080 and the doors of free chatting will open for you. This works both on Android Smartphone and PCs. In the case of PC, you will need to change the web browser proxy settings. NOTE: I haven't tested this cheat on Airtel network or MTN, neither have I tested it with Glo network so I can't confirm if it works on other network aside 9Mobile until it's tested and proven. I must give credit to one of us on WizyTechs Blog known as Bobo B for revealing this tip. But let me ask, why are you not yet on our Telegram Group? Click Here to join over 1,200 tweakers who are already there providing solutions and assistance on topics published on this blog. 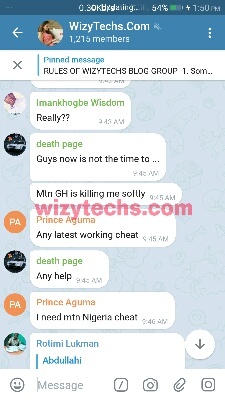 Bros, The cheat you sent on tweakwareVPN on MTN is not working Unless I am missing anything Which I do not think So.